We were compelled to attend by our historical connection (having known Father Seraphim in the last years of his life on earth), but more to the truth – we needed spiritual refreshment and peace. This hungering and thirsting state called us to partake of the Holy Communion with Christ our God at the grave site of our dear Hieromonk Seraphim Rose. Over 300 people in attendance, hot, dusty, infants to elderly and infirm, we gathered in peace and joy. Metropolitan Hilarion from ROCOR and Archbishop Daniil from Bulgaria were among the many abbotts and clergy that served that day. Abbott Hilarion has brought great peace and harmony to the brothers of St Herman’s as reflected in the choir and services. The entire brotherhood was most gracious and hospitable. We lacked for nothing. Abbott Hilarion served a panikhida for our reposed sister in the Lord, Agafia Prince, with the voices of the old guard: Mary & Katherine Mansur, Solomonia Nelson, and the new Mother Nectaria, Mother Theophani, Anna South, John Moran, Seraphim and myself and others led by her sons subdeacon Martian and Alexander (Ax) Prince. All night Vigil was packed into church and overflowing into the court yard of St. Herman’s. Monks and nuns clad in black, silent shadows of prayer. We worshiped with oneness of mind in our reverences and voices…in the name of the Father and the Son and the Holy Spirit… Confession heard under the stars, warm tears of repentance shed in a full moon night. Candle glow flickering within the heart of of the church. Father Seraphim can you hear me…? Will you pray for me…? Talks by Abbott Hilarion, Fr. Damascene, Metropolitan Hilarion of ROCOR, Mary Mansur, Solomonia Nelson, Seraphim and myself, Martinian Prince and John Houdanish – were clearly a cross cut of ages, experiences and inspiration. All said Fr. Seraphim had a great love of God and represented “essential” Christianity. He was brilliant in mind and soul but never made one feel like he/she was “less than” himself in understanding. He always directed our beings to Heaven through prayer, fasting, reading the Gospels, the Holy Fathers and simply loving each other in humility. Having been asked to speak several months ago, I prayed and wondered what could I possible have to say!! My experience was so limited. I was so young in the faith, I was barely 30 years old and had a husband not yet converted and 4 children under the age of 6! I was so busy I didn’t have a chance to read his books, I didn’t have time to talk to him. But when he was in our home, I just wanted to stand near him. In “Wounded By Love, The Life and the Wisdom of Elder Porphyrios”, on page 14, he describes a story of a monk just wanting to be near the Elder. He didn’t have any questions, ” I wish for nothing more; it’s enough for me simply to look at you, Elder.” The monk “was inhaling him, … he was breathing in the grace of God through him.” When I read this recently, I thought, “That’s it! !” That’s what it was like for me to be around Fr. Seraphim Rose. It was enough to stand next to him. So what I said was, that, what Fr. Seraphim gave to me, to all of us, was the ancestry of Christ’s Love through the Holy Orthodox Church, the Saints, Vladika John, the Optina Elder’s by way of Bishop Nectary, Valaam Monastery and all those that came before with their blessings of God’s love, to all those that are here today and those that could not be here today, to all those that lie asleep in the Lord up there in the cemetery and those of us that hope to be buried on that hill, and all our children and grandchildren raised in the love of the Lord. 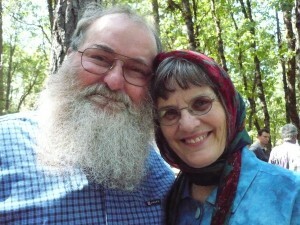 Father Seraphim would be happy about how his little family has grown in Love of God. So, young mothers, continue to struggle to keep the faith and to raise your family in an Orthodox manner! Keep praying!! Keep taking your children to church!!! If you are married to a non-Orthodox, continue to struggle in love! Keep praying,… Keep praying!!! Father Seraphim is just beyond the grave praying for us… praying for us! I thank St. Herman’s Monastery for their warm welcome and sweet hospitality, and all those that were kind to us. We continue to pray for you, the Desert Dwellers of the Red Dirt. May God have mercy on us all.